Our company is specialized in inbound tourism, working with leading edge technology to provide the best service and attention to our customers. Our operation began in Puno, backed by 24 hours and 365 days operational support. Our team of specialists is highly trained to meet the demanding market of inbound tourism, planning carefully the tailor made itineraries, ensuring an efficient and professional service. 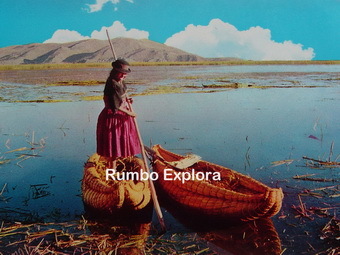 In addition Rumbo Explora is committed with the development of a more responsible tourism and sustainability practices. 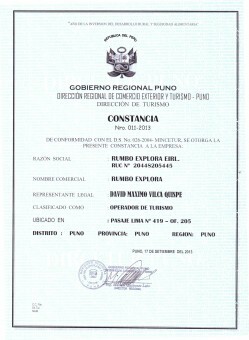 RUMBO EXPLORA E.I.R.L, operating with RUC Nº 20448205445, Authorization License from Municipality of Puno C/P. 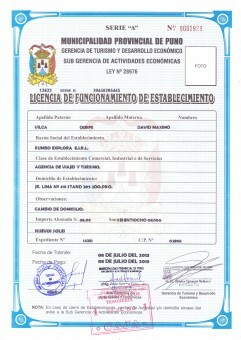 Nº 02866 and Permission of Authorization GR Nº 011-2013 PUNO/DIRCETUR. We are a company based in Puno – Peru, we are focused on classical and non touristy tours to Lake Titicaca, Machupicchu, Colca Canyon and Lima. 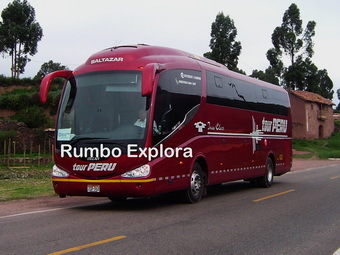 Rumbo Explora offer stunning routes like Trekking to Salkantay and Ausangate Mountain and Inca Trail in partnership and shared operation with what we consider to be one of Cusco’s best tour operators, exclusive for our demanding customers. 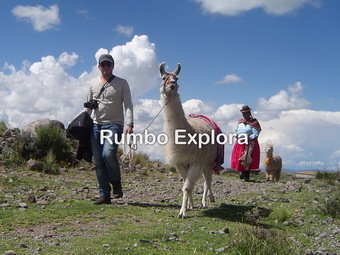 Our partner in Cusco is operating Inca Trail for many years, and they are considered the second best Trek Operator, this way, we can ensure a consistent level of service in all of our adventure operations. All tours we offer are private unless only a shared option is available. Our company will guarantee the spaces booked only when having paid the full amount of passengers. The booking will be first confirmed by the governmental institutions (Ministry of Culture) then our company reply to you by e-mail, this meaning that spaces are available on the Inca Trail for the departure date. So if you wish to travel to the Inca Trail with us, we recommend you make a booking until you have all the group details (full names, passport numbers, ages and others) and you are sure about your trek departure date, because these details cannot be changed after we have bought your trek ticket. Rumbo Explora works according to the Resolution 002-2004-UGM-CD, published in the news paper El Peruano on 12 November 2004, modifying the Trail Regulation. Currently, following UNESCO recommendations, the Peruvian government has strictly limited the number of people permitted on the Inca Trail (permits for about 180 trekkers per day plus 320 porters & guides). We recommend you make a trek booking as early as possible to find spaces on the desired departure date. In 2015 we have managed to obtain trek permits for all of our clients, but trek permits for some dates sold out more than 7 months in advance. Please send an e-mail and we will confirm your booking as soon as possible. Otherwise, as a second choise we have also available another alternative routes like Salkantay and Ausangate Trek. 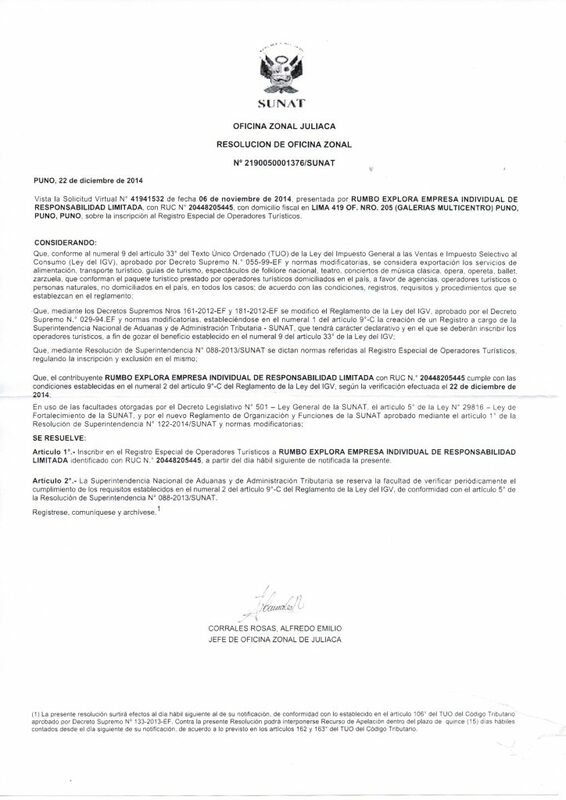 All information provided by you will be submitted to the Ministry of Culture office who regulate the access to the Inca Trail in order to be included in the official list of permits on the requested date. 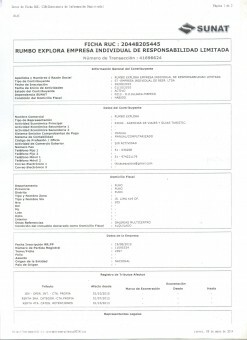 If there is any information missing due to some circunstances as new passport number, names-surnames and others, we kindly request you inform to our company as soon as possible for the change, otherwise you will pay a penalty before departure or maybe not be admitted to enter on the Inca Trail. Our company excludes any responsibility for a no entry in case the passenger information is not exact as in the official permit, the authorities in charge reserves the right not to allow the entry to any visitor whose data are not the exact ones as those in the official permit. For most of our visitors, age is not a concern. However, a reasonable level of fitness is required, as most holidays require short walking, sometimes on uneven ground. Even relatively mild activities can be strenuous at altitude. High altitude trekking is more strenuous than an equivalent length walk in your country. The Inca Trail program is offered by several tour operators for 02 and 04 days walking with full porterage, passing over 4150m and an average altitude of 3050m. Besides its difficulties the ascent and descent of the first pass, known as warmihuañusca pass. The Inca trail trek is certainly possible for anyone in a good state of health and fitness, but we would not recommend to visitos who is totally unused to walking. Share the post "Operation Permits"